This week is Classified Employees Week in the schools. Classified employees are all staff who work in the schools who aren’t licensed teachers. That’s a TON of people! And we can’t NOT celebrate them! They are the cooks who work in a hot kitchen everyday and the instructional assistants who help all of our students in the classrooms and on the playground. Classified employees are the secretaries who have to deal with mad and irate parents everyday (yes, believe it or not, they do) and the custodians who have to clean up puke and all the mess from 600 kids eating lunch. So not saying thank you is just wrong. Right?! We’ve made some fun gifts over the years as thank yous that are easy and quick but mean so much to the person receiving it. This is a fun way to package a gift card to the local coffee stand! And who wouldn’t love a “sweet gram” covered in candy bars? This fun pencil holder would be perfect for the school secretaries or instructional assistants. This is a fun way to say thank you – a sucker bouquet. This is such an adorable flower pot from Kids Craft. 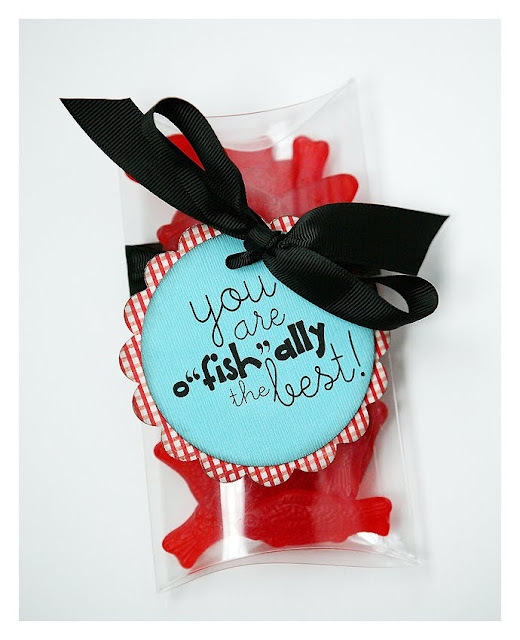 Tell them that they are o-fish-ally the best! Domesticated Lady made these cute popcorn gifts. Just substitute (ha! no pun intended) “teacher” with secretary or cook, etc. I just love these cups! I’m so stealing this idea from Pens and Needles! I wish a parent would give me this cute idea! An apple and dip! And who wouldn’t want a delicious baked good with this cute printable tag? Another cute idea from Room Mom 101. The Fickle Pickle made these cute gifts out of juice and too cute tags! Nothing But Country made this cute idea and has free printables to go with it! (This one says family but there are also tags that say “Star of our School”. This idea is so simple and so cute! And there’s even a free printable! Yah! Another simple but super cute idea (with printable!) from The Hip Mamma’s Journal. so many great ideas. I have always loved the chalk paint flower pots. this is the flipping BOMB…wow, thanks for the GREAT ideas. Lots of great ideas here, Erin. I think my favorite is the Dutch Bros. gift. Fun post. You’re blog is awesome and I just passed on the Liebster Blog award. Thanks for sharing your great ideas. I know whoever receives these gifts will appreciate your thoughts and kindness. When I was in junior high, teacher appreciate day was just taking off. My mom called all the moms asking them to have their kids write a note to their teacher. Mom and I made cookies and a poster for the teacher’s break room. Sadly, myself and maybe 2 other kids participated, but the teachers thanked each of us for days for our kindness. You know what they say….when you do something nice for others, you always get more in return. Having your kids help make these gifts would be a great way to teach that, so thanks for sharing these easy ideas at my party! Thanks for posting such a wonderful round-up of cool teacher gifts! I know I commented before, but stopping by again to let you know I featured your teacher gift ideas on my Saturday Picks! Thanks for making this a great addition to my party. There is a featured button for your sidebar or a feature bag if you are interested. Hope you are having a great weekend! Please remember the parapros/teacher’s asst. They are over looked many times. Teachers could not do what they do many times without that person helping them. Many times they do more than some teachers. They are under paid and under appreciated many times also. Oh, who knew!? Thanks so much for sharing! I had no idea and you’re right, these people go un-thanked! Great ideas! These are all wonderful ideas. As a former instructional assistant, I can attest to the fact that we are often underappreciated. I would even go as far as to say that IA’s often do way more than parents realize, and they think that the teacher did it all. I worked with our kindergarteners all year long with their reading and the teacher never did that but yet she spoke with the parents as if she had. I was there for the kids so I didn’t mind but you see what I mean? Again, thank you for the great ideas for us “other” teachers. 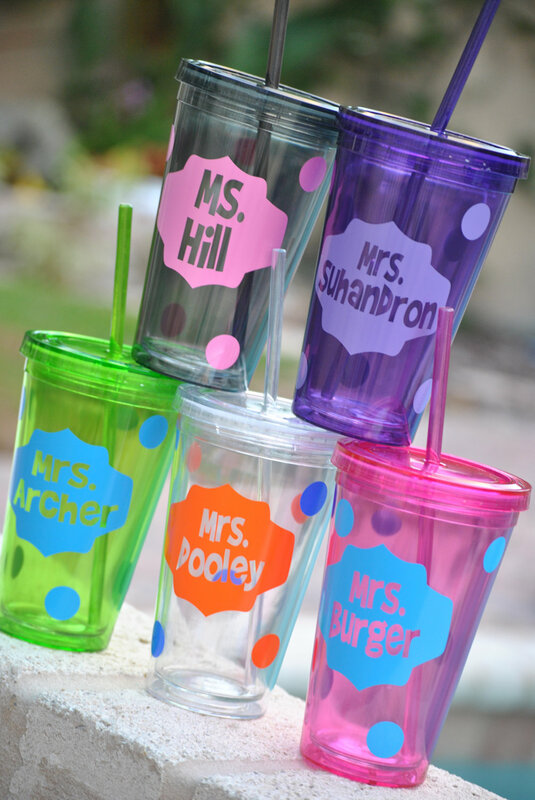 How did you personalize the cute tumblers? They are adorable!